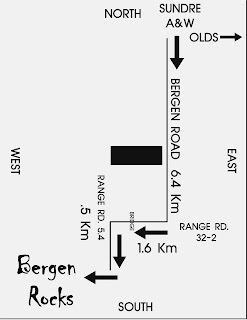 Bergen Rocks will take place July 15 - Aug 15. Five sculptors from around the globe will each create a monumental sculpture in stone over the month. More than 100,000 lb of stone will be used, the public is welcome to visit the site daily to watch these artworks being created. (Open 1-5, closed Tues, $2 addmission) The life span of the sculptures should be 2000 years or more. An onsite art show and the opportunity to view the 5 sculptures created last year are other interesting things to do at the symposium. 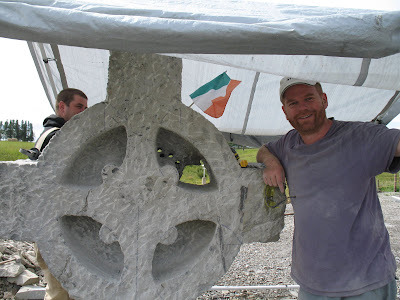 It's very interesting to watch as tons of stone are shaped by cutting, wedging, drilling and chiseling. The organising committee received 43 proposals from artists in 17 countries. It was very difficult to choose, it was so much easier last year when I drew the names from a hat. Thank you to all of the sculptors that submitted an application, we would like to be able to choose all of them. BC marble and Alberta sandstone will be used this year. The marble is beautiful material ranging from nearly pure white to grey, many pieces are streaked with nearly blue lines. 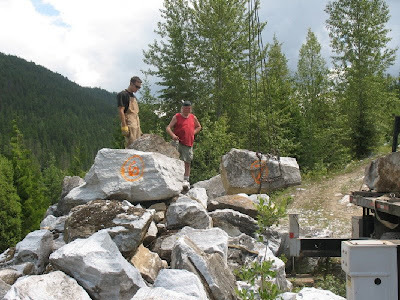 The quarry for this marble is in a remote area of BC up a small logging road. The stone is not sawn, it was almost a full day to scout out which boulders to take. 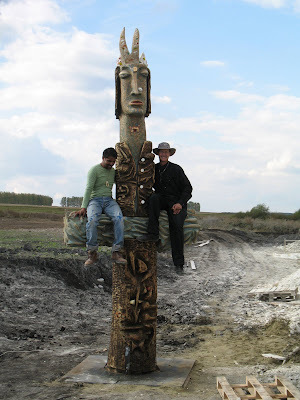 Our sandstone in Alberta is very good quality, next week it will come for Paul and Chander's sculptures. All of the sculptures should have a life span of 2000 or so years. 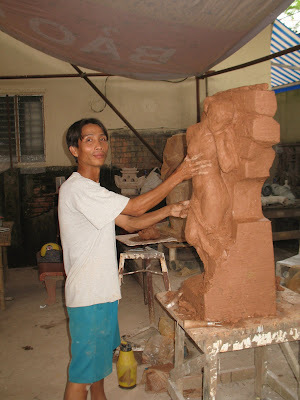 There are many sandstone sculptures created around the time of Christ that are still in good condition. Loading stone at the quarry in BC., the site is nearly on the top of a mountain! It was impossible to get a truck with trailer into the quarry so each boulder had to be loaded onto the bed of the crane truck and shuttled down the mountain where they could be loaded onto a trailer to be trucked here. Iane Dobson (red shirt) and Deb Wilson (Evergreen Carvings in Jade) helped out in a huge way with the marble. It is amazing how people,from across Canada and around the world, pitch in to make this event possible. 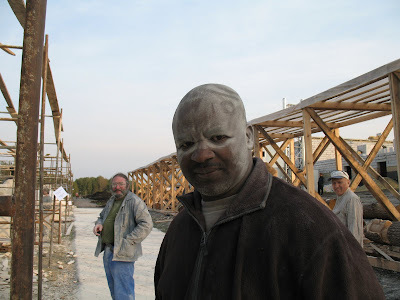 Iane spent the whole day helping to load the stone, Deb came up to the quarry (2.5 hr drive) to scout out the stones, then went up with the owner of the crane company another day and again for the full day of loading. I still think its incredible what can be accomplished with a network like the Atti2ude Club, members from across the country and around the globe selflessly offer to assist in any way they can. Events such as Bergen Rocks take place in many other countries, club members are involved in the organization of many of them.